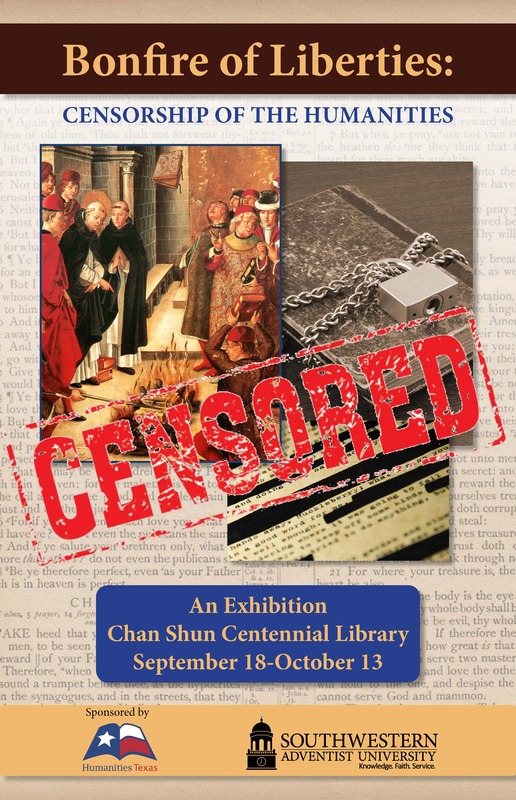 Keene, Texas - Southwestern Adventist University will host "The Bonfire of Liberties: Censorship of the Humanities," an exhibition by Humanities Texas, the state affiliate of the National Endowment for the Humanities, beginning Monday, September 18, 2017. “The Bonfire of Liberties” addresses the difficult topic of censorship. Censorship has been practiced for nearly as long as there have been materials to censor. This exhibition gives an overview of censorship in its various guises over time. The exhibition also examines the struggle between those who want to censor difficult, controversial and revolutionary material from sensitive viewers and those who want to protect the freedoms of all people to read, view and think for themselves. Viewers may be surprised to learn just how many of their favorite books and plays have been censored at some point in history. Highlighting the impact of censorship as applied to the humanities through the ages, this exhibition emphasizes the relevance of censorship to a contemporary audience. Each panel examines a specific subject within censorship through quotes, images and informative text. The exhibit will be on display from September 18 through October 13 at the Chan Shun Centennial Library and is open to the community. Humanities Texas develops and supports diverse programs across the state, including lectures, oral history projects, teacher institutes, traveling exhibitions and documentary films. For more information, please visit Humanities Texas online at http://www.humanitiestexas.org or call 512.440.1991. Chan Shun Centennial Library is open from noon to 10:30pm on Sundays, 7:30am-10:30pm Monday through Thursday, 7:30am-2:00pm Fridays, and closed on Saturdays. It is located at 101 W Magnolia Street, Keene, Texas. For more information, please call 817-202-6242.